ChyronHego’s latest version of Click Effects, PRIME is a highly integrated, turnkey graphics authoring solution for live arena and stadium-based A/V presentations to maximize fan engagement and drive commercial opportunities. With Click Effects, fans can experience many of the same visual elements, such as enhanced graphics & play-by-play analysis that they’re used to seeing on live TV. Come and see this for yourself at Techtel’s Stand L52, Integrate Show, ICC 22-24 August. The Click Effects platform is complimented with the image processing from 7thSense Design’s award winning Delta Media Server. 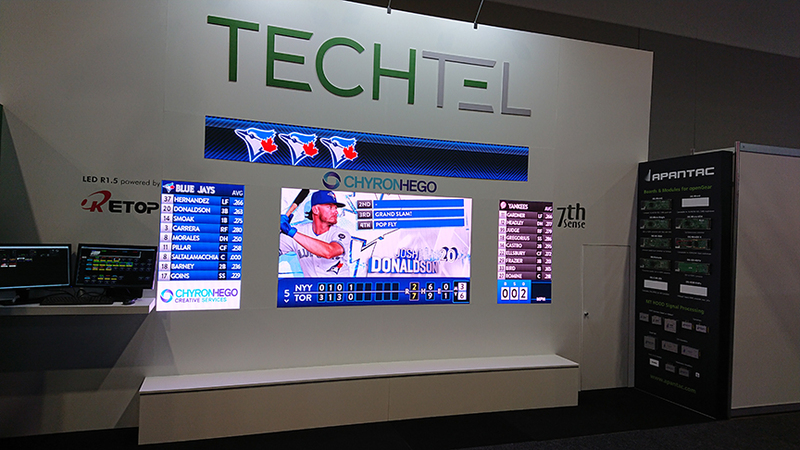 In addition, Techtel will be showing a range of Retop's high performance indoor and outdoor LED screens. These have a wide foot print in Asia, Europe and USA, and are now building on their years of global success in Australia. Don't miss this first-time ever showcase of Retop's high performance indoor screens at Integrate, and come and talk to us about our various buying options and flexible contract terms. Both ChyronHego and Retop representatives, as well as Techtel’s system integrators will be available to answer any of your questions at the Integrate Show.